Cracker Barrel Old Country Store was a billboard-only brand for more than 40 years. Now, it's betting big on a wider variety of advertising from TV to digital. "Billboards have been part of the brand from the very beginning," Chris Ciavarra, svp of marketing for Cracker Barrel, told Adweek in an email. "Danny [Dan Evins], our founder, saw Cracker Barrel Old Country Story as a nice place to take a break from interstate travel, which was new at the time. Travelers did not have many nice places to stop, making our stores a welcome reprieve,"
Times have changed, though. Billboards were once a great way for the brand to capture the attention of hungry travelers on the highway, but with the rise of smartphones and tablets, it was time for the brand to step outside its comfort zone. Billboards will continue to be an integral part of Cracker Barrel's marketing, but it will also put more effort into capturing the attention of locals with national broadcast TV spots, paid search and social, online video, and radio. While this isn't the first TV spot for the chain—Cracker Barrel has dabbled in TV for the past four years—Ciavarra said it does represent the brand's biggest push to date. 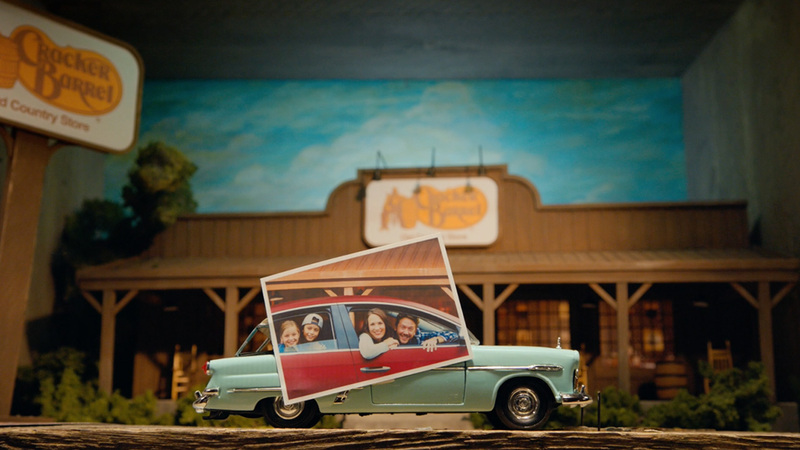 The two new 30-second spots from Havas Worldwide capture the charm of Cracker Barrel restaurants with a homey feel. "With brand imagery that so perfectly fits the holidays and a retail shop to match, you can imagine how big this season is for us," Ciavarra said. "Our early spots demonstrated what kind of place and people we are. We then moved to the types of products that are available in our stores. Our new spots showcase that we welcome everyone to this experience."